Various factors lay behind my trying the Flying Coffee Bean again, not least because my friends at Horsham Coffee Roaster had started supplying the guest bean. 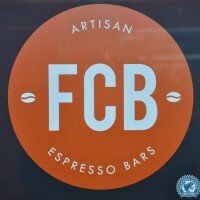 I was also intrigued by a re-branding of FCB as an artisan espresso bar. Fully prepared to scoff, I found myself having to eat my own thoughts. It really was artisan coffee! I don’t often go down to Guildford mainline station, FCB’s home, but since my conversion, I’ve made a point of popping in when I can. On Tuesday I was able to catch up with Mike, who manages the Guildford and Woking FCBs. Amazingly, Mike, who cut his coffee-teeth in Costa a decade ago, recognised me, not from my Coffee Spot exploits, but from when I was a regular at the Costa in Waterstone’s in Guildford all those years ago. Mike’s come a long way since then and, I’m pleased to say, so has FCB. Horsham Coffee Roaster, who have had been providing guest beans for a while now, recently started supplying the house-blend as well, part of FCB’s desire to source locally wherever possible. This led to a widening of the net for guest roasters, with Horsham Coffee Roasters sharing duties with the likes of London’s Mission Coffee Works. All the guests are single-origins and every one I’ve tried has gone well with milk. FCB packs a lot into such a small kiosk. As well as the house-blend and guest, there’s decaf and, for those of that persuasion, tea. The food offering is equally impressive, with hot bacon and sausage rolls in the morning, plus an extensive range of cakes and pastries. Handmade baguettes make an appearance at lunchtime: I know that they’re handmade because I watched Mike making them! FCB sells coffee-making kit and champions re-use, not only by selling a range of Keep Cups, but by offering a Keep Cup discount as well, quite a rare occurrence. I’m pleased to report that JOCO Cup got a discount too! Local sourcing extends to chocolate, with the Guildford branch, under Mike’s initiative, stocking award-winning Kokoh chocolate, made in nearby Ewhurst by Joanna. You can find her at Guildford’s Farmers’ Market, the first Tuesday of every month. I popped by to say hello and, while chatting, was impressed to discover the similarities between good coffee and good chocolate, where it all starts with sourcing the beans. The transformation of FCB from an average coffee kiosk to provider of top-quality coffee is impressive and to be welcomed. If you want to try for yourself, the Guildford branch is on Platform 2. Although it’s through the ticket barriers, just ask the station staff for a bridge pass and wander on in. It’s what I did. This entry was posted in Breakfast, Cake, Guildford, Sandwiches, Saturday Short, Stations, Takeaway and tagged Horsham, include by Brian Williams. Bookmark the permalink. Thanks so much for the great write up. Mike and his team will be very pleased. We have been on an incredible coffee journey in the last 18months and it’s always rewarding to hear that our teams efforts are being noticed! If you happen to be in London at any point please do visit our shop at Denmark Hill Station, I think you will like it! Nice post. I thought the same when they started at Denmark Hill -but they have just started stocking Volcano coffee including my fave mountain blend. Also have to agree keepcup discount is a welcomed rarity as it is their generous NHS discount!! Keep it up FCB!